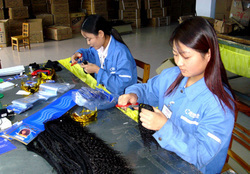 Xuchang Mrs Hair Products Co.,ltd is one of the leading Human hair extension manufacturer In China Since 2006 . 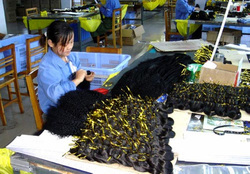 We Located in Xuchang , China ---------the biggest human hair production center, which is a reliable manufacturer and professional supplier of 100% human remy hair and 100% virgin natural hair. Our hair extension business scope includes 100% human hair ,remy hair ,Raw hair material, single drawn hair, double drawn hair,keratin hair extension,I tip hair , Nail hair, Flat tip hair, V tip hair , pre-bonded hair extension, hair clip hair extensions, hair weaves, micro ring hair extension, tape hair extension, loop hair extension, EZ WEFThair, Feather hair extension, PU skin weft, hair pieces, toupee, human hair lace wig and so on. 1. We are Manufacturer. Not wholesaler or trading company. ----------We will quote you Factory Price . 2. 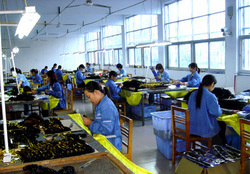 Middle sized factory ---------We will value our each customers . 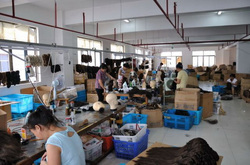 Compared with Big factory doesn't accept orders less than hundreds pcs usually. they only pay more attention to their very big wholesaler. Compared with samall company , they don't have good qulity control. 3. After Sale-serve : We will follow up your every order , try to solve every questions from you , Hope to extend your business with our products and service . If you have the idea to place an order or have any interest in our products, please contact us by sales@mrshair.com or call us by 86-374-2665803. We will give you reply within 24 hours.